Many Australians don’t realise the relationship they have with their native birdlife. Having giant cockatoos fly up to their homes and have the opportunity to socialise with them is something that happens in very few places on Earth, but here seems to be the norm. Sulphur-crested cockatoos have become a part of the landscape and a part of our daily lives. But how much do we know about this fascinating species? Dr. John Martin, wildlife ecologist, had an idea to learn more about these extrovert giants, and this idea became the first app to monitor them in the Sydney region. He co-created Wingtags, which relies heavily on citizen scientist participation to learn everything there is to know about these cockies. 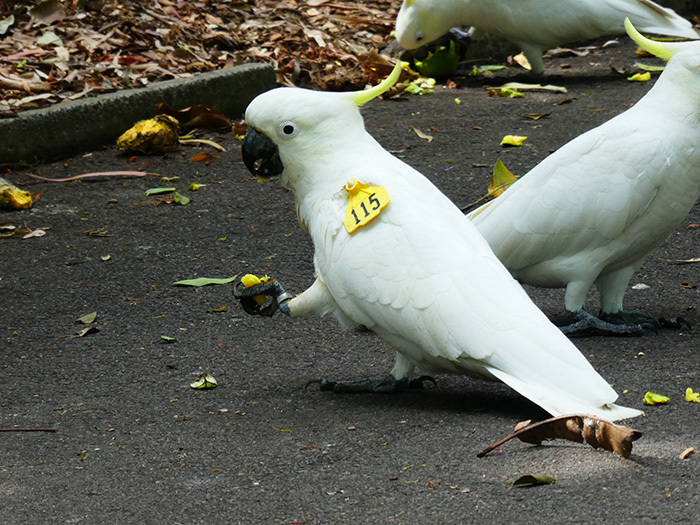 This research commenced on 16th September 2011 when ‘Columbus’, Cockie 001, was tagged within the Royal Botanic Garden in Sydney and up to date these tagged birds have now been spotted more than 10,000 times by the public. And the data is fascinating. Roberta (121) and mate at their nesting hollow. What made you so incredibly curious about this particular species to begin this research project? My colleague, Dr. Adrian Davis, and I were driving to Canberra and chatting about our common interest in sulphur-crested cockatoos. I was interested in the population dynamics, as I’d see flocks of birds but had no way to understand the intricacies of individual behaviours and movements. Adrian had been monitoring tree hollows and identified cockies as a common species across the Sydney region, and similarly had pondered the population dynamics. Are cockatoos close to your heart? I love nature, I have chosen this career as I wanted to spend time in nature. 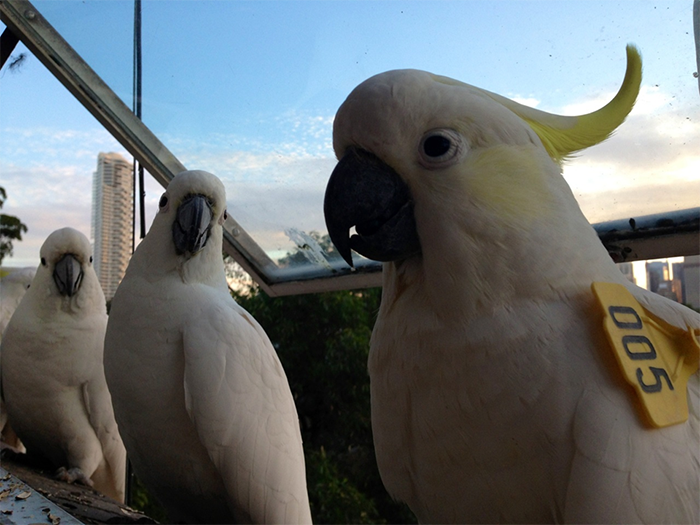 I’ve absolutely grown to love sulphur’s, before the wingtags research I was a fan of cockies, but I didn’t know them. Now I observe cockies most days, and have a greater interest in parrots in general. One of my favourite birds is the yellow-tailed black-cockatoo, they have different behaviours to the sulphur’s, they aren’t the hooligan characters that sulphur’s can be, but their call and flight is inspiring. Freya (068) an adult female Oz white ibis and friends foraging. 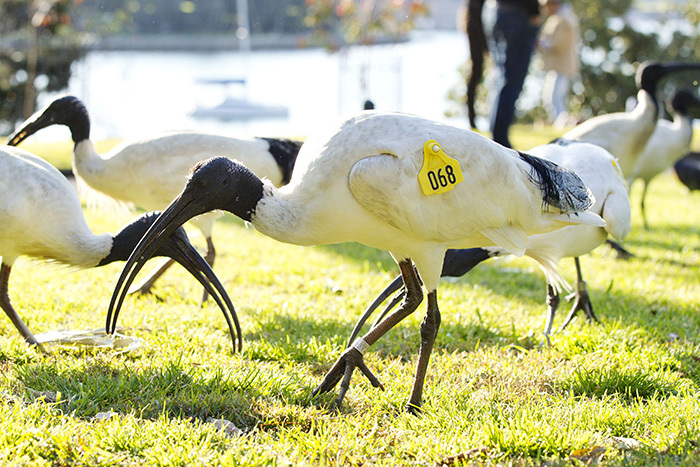 The Australian White Ibis can also be reported on the Wingtags App. Why is this species so misunderstood? Why should we be reporting this bird? 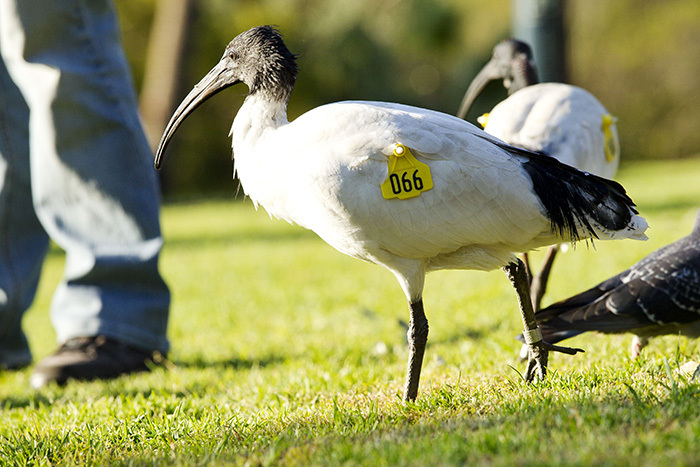 There are a couple of key reasons why ibis, aka bin chickens, are misunderstood. First, in my experience, is that many people don’t know that they are the ‘Australian white ibis’, but think they are the sacred ibis, an African species. We Australians are familiar with the issues associated with invasive species (e.g. cane toads), as such ibis have been lumped-in with these undesirables. In addition, they are big, which scares people when they approach looking for a free feed. Add to this that they can be smelly, scavenge from bins, and nest in undesirable locations (e.g. public parks, schools), and people quickly vilify them. We need to change this; ibis need to be viewed as a conservation messenger, as they are but one of many species that have been shown to have declined in the inland wetlands (e.g. Macquarie Marshes) due to human alteration of our rivers. Ibis have adapted to urban areas and are thriving, but they alone have made this behavioural change. Reporting your sightings of wing-tagged birds, e.g. ibis or cockies, helps us build a picture of individual birds and the species behaviour. For example, banding data from the 1950’s showed that fledgling ibis moved from the inland wetlands as far north as Papua New Guinea. More recently an ibis chick banded in Sydney’s Centennial Park was subsequently observed in Townsville, north Queensland. This indicates that the ibis population is nationally connected. Sonnyboy (134) perched at the tree hollow where he nests in with Lemon (056). What remains the biggest mystery about the Sulphur-crested Cockatoo? Almost everything. Most people will be surprised to learn that we know very little about our big, loud and noisy friend, the sulphur-crested cockatoo. Yes, we know about their breeding and what they eat, but we know very little about everything else. Piña Colada (005) and friends prefer to drop-in through the window when visiting friends. The most interesting discovery made so far? The minimal distance that the cockies move has surprised me the most. I expected a large bird such as this to move 10’s of kilometers per day, and further over longer periods. However, we have found that birds move within an ~5km area, and seldom make larger movements. It is important to note that these are urban birds, it would be interesting to compare this behaviour with cockies in agricultural and bushland areas. Dido (115) munching on a mango; fun fact, sulphur-crested cockies predominantly use their left-foot to hold items. Where do you think Australia stands at the moment to ensure the future of our wildlife and ultimately of us? Wow, big question. I think Australia is in a fortunate position as we have a large landmass and a proportionally small population. This means we have large areas of land that are in relatively good condition, which is great for our native plants and animals and us humans in the long-term. That being said, Australia has the worst species extinction record of any country, indicating that our unique native species are highly susceptible to change. The importance of our land, and our species, needs greater recognition. Annie (066) pictured when a juvenile ibis (~4 months old) as indicated by the feathered head; ibis >3 years are adults. If you could implement any other countries environmental law in Australia, which one would you choose and why? The glaringly obvious answer must relate to curbing our emissions. We need action that implements renewable energy sources and programs to remove carbon from our atmosphere. What will the information collected by Wingtags be used for? How powerful is this data? 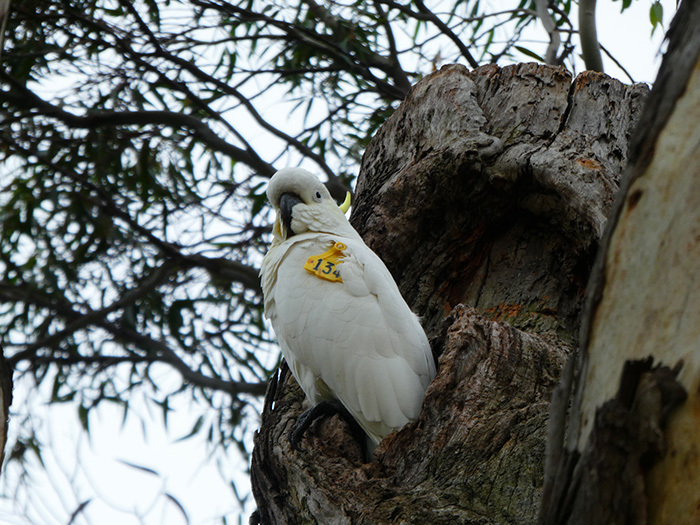 The Cockatoo Wingtag program aims to increase our understanding of this charismatic species. There are many uses for the data, but one of the unintended outcomes, likely the most important, is community engagement with nature. 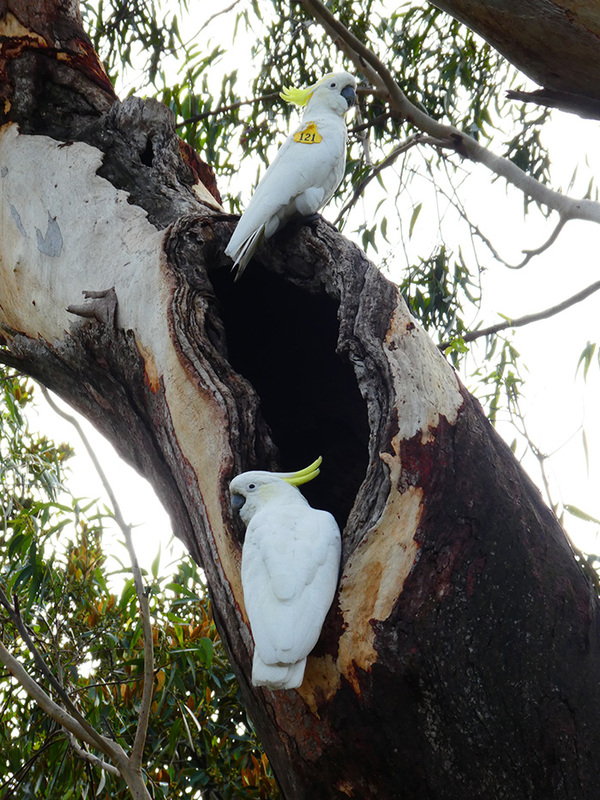 Specifically, the importance of tree hollows (see www.hollowsashomes.com) for our native species across Australia. The data is powerful, as we are fortunate to receive lots of reports from the community. This means that we are able to interact with lots of members of the community, and hopefully increase their appreciation of nature. 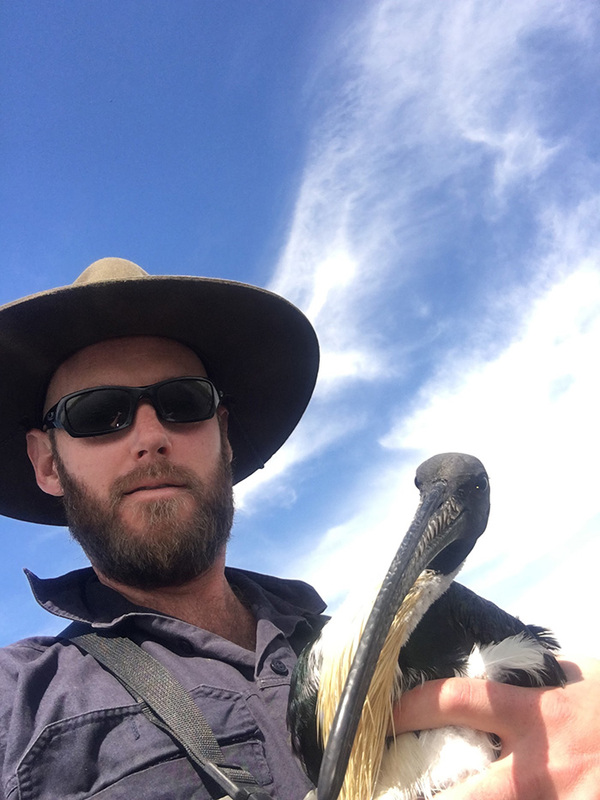 Dr John Martin with a straw-necked ibis at the Macquarie Marshes. We create unique & locally made fine art prints and toys that save species. ® Eggpicnic is a registered trademark. All work is protected under copyright law.